Product description:These mouth-watering morsels are the perfect training treat for dogs of all sizes. Dogs love meat. 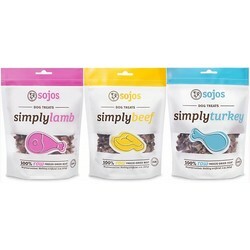 And that’s just what they get with Sojos Simply Meat Treats. It’s the real, raw meat your dog craves. And for you, it’s all the more delicious knowing that every morsel is gently freeze-dried, under our own roof, to lock in the natural enzymes, vitamins and minerals.